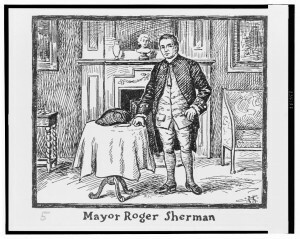 Born in Newton, Massachusetts, on April 19, 1721, Roger Sherman was the second of seven children born to William and Mehetabel Sherman. William was a farmer, as well as a cordwainer, and helped teach Roger his early trade. A natural ability with numbers helped Roger teach himself surveying. When Roger was 19, William died and Roger assumed responsibility for his father’s estate. He moved the family in June of 1743 to join oldest brother William in New Milford. Sherman’s self-discipline with his surveyor training paid off two years later, when the Connecticut General Assembly appointed him the surveyor of New Haven County and, later, Litchfield County, a post he held until resigning in 1758. It was during these years in New Milford that Roger began to actively participate in town affairs, perhaps motivated by his growing interest in land speculation. It was also at this time that he married his wife, Elizabeth Hartwell. Roger and Elizabeth wed on November 17, 1749, and had seven children. His three oldest sons would serve as officers in the Continental army. Roger soon expanded his interests into retail, opening a store that sold tables, chairs, brooms, razors, and other household items. He also began publishing almanacs. In his almanacs, Sherman included entries on astronomy, religious festivals, weather, and his views on the values of colonial currencies. These pursuits did not keep his attention for long, however. Roger began spending more time surveying and also took up the study of the law. 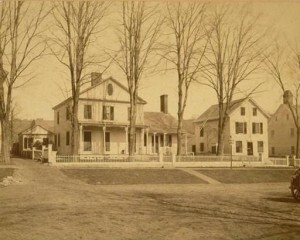 Sherman passed the bar in February of 1754 and the following year became justice of the peace for Litchfield County, an appointment that coincided with his election to Connecticut’s General Assembly. Shortly after the death of his wife in October of 1760, he resigned his political post and moved his children to New Haven. After arriving in New Haven, Sherman gave up practicing law, as well as surveying, and once again settled into life as a merchant, opening a store of books and general merchandise located across from Yale College. Not long after, as he was returning from a visit to his brother in Woburn, Massachusetts, Rebecca Prescott, the niece of his brother’s wife, passed by him on the road. Roger turned his horse around and headed back toward Woburn to begin a courtship that ended in his marriage to the 20-year-old Prescott on May 12, 1763. Roger’s second marriage resulted in the birth of eight more children. A rapid succession of political appointments followed Sherman’s marriage. In 1764 he was again elected to the General Assembly and in 1765 appointed justice of the peace for New Haven County. Shortly after, he took on the additional responsibility of being the treasurer of Yale College, a post he held until 1776. The tide of sentiment that was rising in the colonies at this time did not fail to capture Sherman’s interest. The increasingly restrictive policies of the British parliament resulted in the passing of numerous acts aimed at garnering revenue from the American colonies. Parliament passed these acts without colonial consent. The announcement of the 1773 Tea Act motivated Sherman to declare his belief “that no laws bind the people but such as they consent to be Governed by.” His reputation of service to the colony, along with his strong patriot sentiment, got him elected as a delegate to the first Continental Congress. In 1784, Sherman returned from Congress and was elected the first mayor of the newly incorporated city of New Haven. Three years later, while still mayor of New Haven and a judge of the Superior Court in Connecticut, he was sent to represent Connecticut at the Philadelphia Convention. At the convention, Sherman was integral in shaping the country’s new constitution. In addition to being a vocal supporter of Alexander Hamilton’s proposal for federal assumption of states’ debts, he is credited with fathering the Connecticut Compromise, which ultimately led to the formation of a bicameral legislature (with the size of representation in the House being based on a state’s population, but the size of each state’s representation in the Senate being equal). After his service at the Philadelphia Convention, the Connecticut General Assembly elected Roger to serve in the US House of Representatives in 1789. The posting conflicted with his judicial responsibilities and Sherman was forced to resign from his judgeship. Two years later, William Samuel Johnson resigned his Senate seat to concentrate on his duties at Columbia College in New York City. Sherman was quickly named as Johnson’s replacement. His service only lasted until March of 1793, however, when he returned home to New Haven due to failing health. On July 23, 1793, Roger Sherman died of typhoid fever. 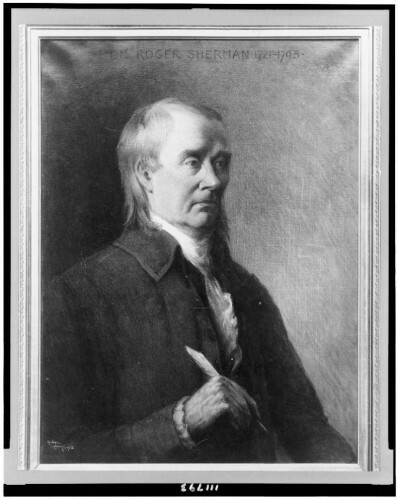 “Guide to the Roger Sherman (1721-1793) Collection.” Yale University, 2016. Link.